If you’ve been following NCK since the beginning, you know I like to do things the hard way. For instance, last summer I spent almost four hours preparing and simmering mushroom and red wine marinara sauce from fresh, peak tomatoes. If you have four hours and you still have some good looking tomatoes, the recipe is worth every minute, but I have a lot of recipes that happen during the 11 and a half months of the year that are not tomato season that still require a good tomato sauce. That’s where this quick chunky tomato sauce, made from whole, canned tomatoes and done in 30 minutes, comes into the picture. While this “canned tomato sauce” is quick enough to make while you prep and boil pasta, it also happens to be a key element of my upcoming recipe for roasted eggplant stacks! I’ve been hoarding the stacks recipe for a while. I have photos, but I took horrible (i.e., no) notes the first time I made it, making it highly difficult to publish the recipe on the blog. As you might have read in recent posts, I was just in Minnesota, so it’s not like I could grab the voluminous cookbook with the original recipe (for another gratin, eggplant al forno) and crank out a test run. Thankfully we live in the age of technology, though, so while I facetimed with my compliant fiancé the other night, I made him send me pictures of both the fresh tomato sauce and eggplant al forno recipes. Let’s not even talk about the fact that I’ve nearly memorized the page numbers in the cookbook–probably not healthy. Anyway, Minnesotan eggplants were especially large, so I whipped up a pan version (two pans, actually) of the eggplant stacks to polish both that recipe and the one for this quick chunky tomato sauce. As I sit here in Connecticut a day and a half later, it wouldn’t surprise me if Dad has already banished any trace of leftovers from the fridge. Let’s take a minute to talk about why this recipe works. First, why do I insist on using canned whole tomatoes? Isn’t it faster to use tomato purée? Faster, yes. However, the more processing applied to the canned tomatoes, the more heat they’re subjected to, and the less fresh-tasting your end product will be. By using canned whole tomatoes and chopping them at home (or smushing them between your fingers, which is super fun), and keeping the cook time short, you end up with the most garden fresh taste possible from a can. Use whatever brand of tomatoes you like. Note that price doesn’t always equal quality, either. I didn’t have time to run around town looking for San Marzanos, so I used Hunt’s, which has some added sodium and a couple dubious sounding ingredients. My sauce was delicious, and I’m sure it would only get better if I sought better tomatoes. In any case, we’ll find out soon, because I’m making yet another batch of tomato sauce for a faux-pasta recipe on the docket. It seems high quality canned tomatoes are slightly more available in east coast states, what with the abundance of Italian folks and sauce making happening on any given Sunday. Next, you might ask why I make you grate sweet onions when this is supposed to be a quick tomato sauce. And trust me, I wouldn’t add unnecessary steps. By using a sweet onion, the need for added sugar or sweetener is eliminated. I like my tomato sauce pretty tart, so just the sweet from the onion is plenty. The wine added to my mushroom marinara serves the same purpose (it also adds depth), so if you’re really in a pinch for time, forgo the onion and simmer the sauce with a splash of red or white wine. By spending the bit of extra time to grate, versus chop, the onion, we save time cooking, because small pieces soften more quickly. 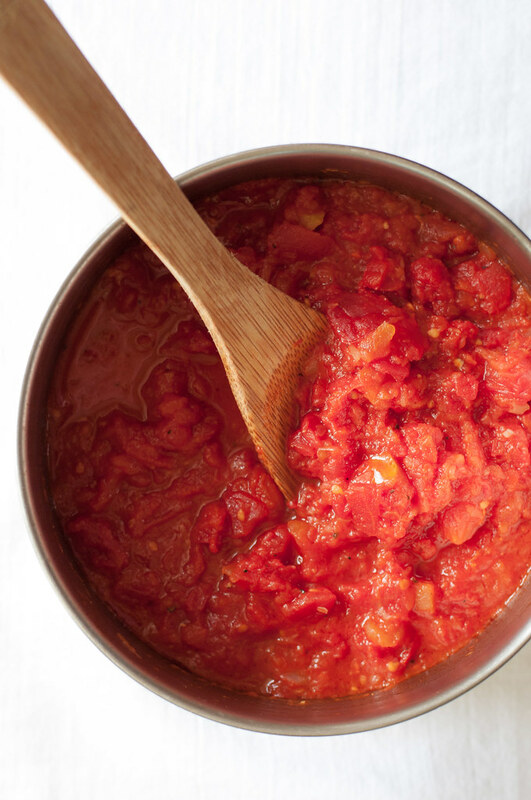 They also permeate more of the tomato sauce, infusing better, more powerful flavor in less time. Grating also produces that onion “juice”, which you must throw into the pot! Again, it adds that much more flavor and helps to break down the tomatoes. Last but not least, why did I go with a 30 minute recipe when I could opt for just 15? Food Network and food blogs and cookbooks have somehow brainwashed us into thinking that 30 minutes is the magical amount of time that constitutes a quick dinner (dang you, Rachael Ray). I’m not sure I agree, but it’s the world I’m living in, so I knew if I went longer than a half hour I might lose your interest. However, it just so happens that the tomatoes soften and break down just right for a marinara sauce in 15 to 25 minutes of simmering, as long as you keep a somewhat watchful eye and don’t forget to stir. 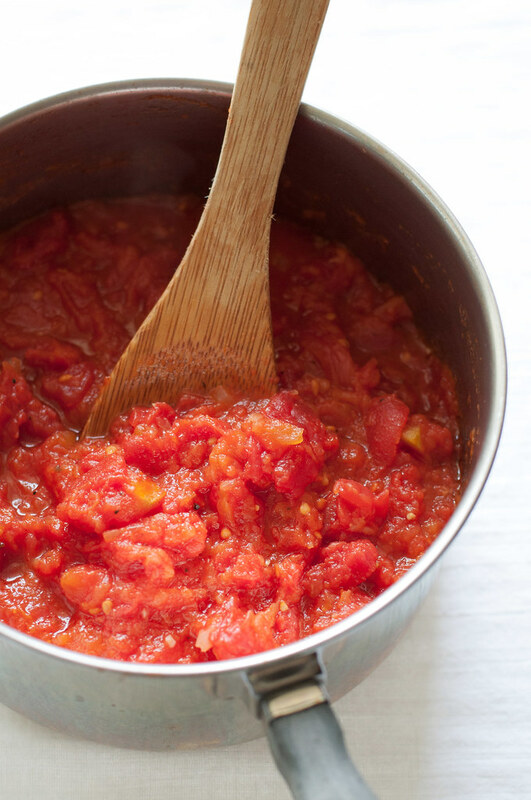 Just enough of the extra liquid, produced by chopping the tomatoes, evaporates during the simmer time to form a beautiful, thick, cohesive sauce. Finish it with a splash of your best olive oil, simple seasoning, and fresh herbs if you have them, and you’re good to go! How are you guys feeling about these subheadings? I’m totally inconsistent with them, but I’m hoping they help you navigate my longer posts to find what you’re looking for, whether that’s an explanation of the recipe or every last detail about my life. I met many (13?) inspiring bloggers at the workshop, all of whom are just trying to make this whole blogging and working and hopefully making-the-blog-my-work thing work. I’ll introduce them to you in posts to come, and for today, I think you’d do yourself a favor to take a peek at Colleen’s ranch hummus (and apricot havarti grilled cheese!) which is super easy but also contains no nasty packets of chemical ranch powder! Give her a shout and make sure to check out her colorful, approachable recipes on the Garlic Whisk blog. To soften the blow of returning from my beloved home state, I was greeted with plenty of rain (I love it! ), Stevie, and a package containing what might become my most prized possession. Yes, my first Ottolenghi cookbook. I’ve waited a long time for this day, and it’s everything my food-loving self dreamed it could be. I want to eat the cover before even cracking the book open, and it’s filled with the highest quality print food photos I’ve ever seen in a cookbook: super sharp with gorgeous colors that make me want to take my fork to the pages. You’ll be seeing many variations of the recipes (hopefully simplified, as they tend to be quite involved by way of ingredients) in my posts in the months to come. Grating a sweet onion for the sauce serves two purposes: the small pieces soften super quick, and it adds a touch of sweetness to the sauce, eliminating the need for added sugar. Drain tomatoes and reserve juice for another use (such as a curry or for cooking rice). Gently squeeze each tomato to seed, then roughly chop or use your hands to squeeze and break up tomatoes into large chunks. You should have around 3½ cups. Heat 1 tablespoon oil in a 2 quart sauce pan over medium high heat. Add garlic and onion. Cook and stir 5 minutes, until onion is softened and starting to stick to the pan. Add tomatoes and bring to a simmer. Reduce heat to maintain a gentle simmer for 15 to 20 minutes. 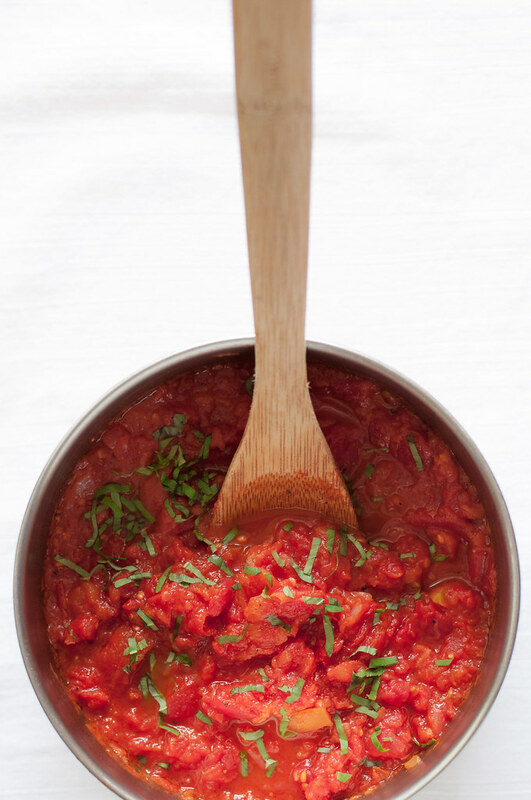 As tomatoes soften, use your spoon to chop and press tomatoes against the sides of the pan, breaking them down further. Off heat, remove garlic and stir in remaining tablespoon of oil plus salt and pepper to taste. Stir in fresh herbs and serve or refrigerate. Liberally adapted from Deborah Madison and Mark Bittman. As written, the recipe is vegan and gluten free. Note: This page contains affiliate links. It does NOT contain sponsored content. 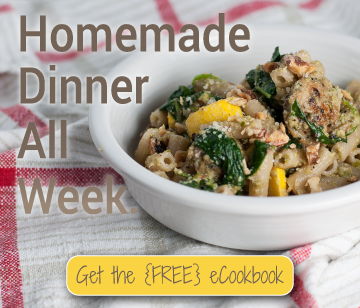 Affiliate links (to products I recommend, on Amazon) offset my ingredient and website maintenance costs, so I can keep bringing you chunky recipes like this one. Thanks! Thanks so much for the shout out! I had such a great time at the workshop meeting so many wonderful women and fellow food lovers :) Your tomato sauce looks devine! I can’t wait to try it!